Fast forward to 2017 – many businesses, and probably some of your colleagues, are starting to move into the “Cloud”. It’s no longer cryptic and the Cloud has picked up a tonne of steam just as the internet did. Popular applications such as Apple’s iCloud, Google Docs and Gmail, Dropbox and Microsoft Office 365 profess to live in the cloud. There is Sales Cloud and Marketing Cloud brought to you by Salesforce.com. Online accounting powerhouse Fresh books has dubbed themselves “Cloud Accounting” software. We could go on. But it’s still early days and decisions on how to handle the Cloud are essential. Here are some Cloud basics and what it means for business owners. We’re going to speak in layman’s terms. If you’re already up to speed you may be bored but please share this post with whoever runs your business and your colleagues and add your own color commentary. Anything you access remotely from your web browser that is not running on your machine is probably in the Cloud. It means the files or applications (e.g., email, calendars) you use are stored on servers accessed when you’re connected to the Internet. If you’ve read about the Cloud, you may have heard about SaaS (Software-As-A-Service). SaaS refers to applications and all associated data and infrastructure accessed through an internet browser or smart phone app. These are generally subscription-based services. You pay a monthly licensing fee or pay per use pricing models. IaaS (Infrastructure-As-A-Service) refers to “hardware” you pay to access (e.g., servers, virtual machines, connectivity). You set up and run your own applications and operating systems. The provider takes care of all the hardware and infrastructure. For the Business Owner: Assess if you should subscribe to third party applications or build your own. You’ll also need to decide where it makes sense to run these applications on hardware owned and maintained by someone else versus keeping the IT on-site or buying machines stored in someone else’s data center. Adopting the Cloud versus buying and managing IT infrastructure is not an either/or decision. Most companies are operating in a hybrid manner with some software and infrastructure running in the Cloud and the rest running locally at their office or data warehouses. 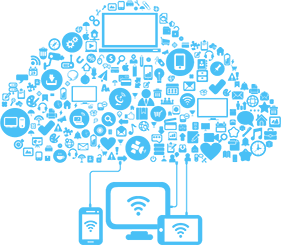 We’ll article in the future about key issues to consider as you evaluate what should go into the Cloud for your business. If you suffer from aging infrastructure or applications, shifting to Cloud-based solutions enables technology and application upgrades without shouldering any capital costs. You’ll pay to migrate data from your own applications to a third party service and configure the application to suit your needs; and also pay to cutover to a new IT environment. Someone else pays to maintain this stuff. For the Business Owner: Conduct a cost/benefit analysis on moving IT into the Cloud; and using third party apps versus building and maintaining custom apps (this is not a one-size fits all answer. Read our articles on the pros and cons of building custom software versus buying third party solutions.) Sometimes moving to the Cloud offers time savings and reduced costs for employees/contractors who previously maintained your IT freeing them to work on more strategic IT initiatives. But in some cases Cloud-based, SaaS solutions are much more expensive. Security can also be an issue. Maybe you need to build your own application but host it in the Cloud? Lots of issues to think about during your analysis. Cloud services offer flexibility to add or subtract IT infrastructure as equired to match IT costs with actual business requirements. This is especially useful for highly cyclical businesses where computing requirements and headcount expand and contract regularly. For example, this flexibility is great for retailers during the Xmas rush or construction companies who slow down over in winter. For the Business Owner: Examine how your computing requirements change year to year. If there are significant and consistent changes – Cloud solutions are attractive. If you’re growing fast and cannot predict your requirements, tapping into the Cloud can allow you to scale as needed and not overspend on IT. It will also allow you to focus on growing your business rather than your IT. We’ve tried to introduce some Cloud basic concepts here. But deciding how to leverage the Cloud is anything but basic. We’re seeing companies rushing to the Cloud without a full grasp of the implications. Find a trusted advisor to help you navigate the Cloud. If you’re looking for that trusted advisor we’ll put our hand up. Check out our Cloud Services. We’d be happy to help you out.